A small hand saw that has the top of the blade stiffened with a metal rib of steel or brass. The largest of the back saws which is used for cutting the shoulder joints for tenons.Usually with an enclosed handle. A joinery and cabinetmaking back saw with a small thin blade and fine teeth. It takes it's name from the dovetail joints that it is used for cutting. Usually with a small open handle. 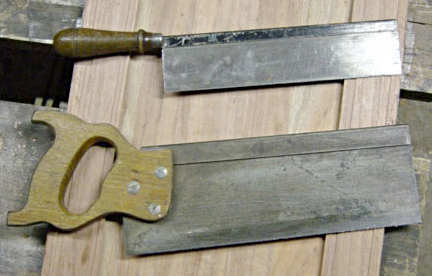 A smaller version of a dovetail saw with a straight round handle. At the top of the photo above is a small Gents Saw which can be used for making dovetail joints, as can any of the saws on this page. The normal rule is the smaller the job then the smaller the saw. The gents saw is the smallest of the back saws usually with a straight turned handle. They range in length from 100mm 4" to 250mm 10", and they have around 30 to 17 teeth to the inch, or 25mm. 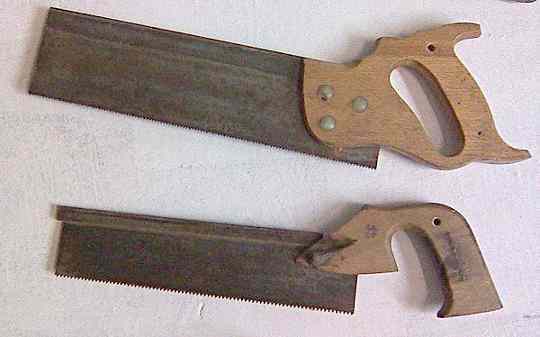 The smaller saws are popular with model makers. Just underneath it is a Tenon Saw which is quite a bit larger. As the name implies the saw is used for cutting tenon joints. Very small joints like glazing bars it will do the face of the tenon and the shoulders. When we get to cutting the face of tenons for say a door then the ordinary panel saw is used as the teeth on the tenon saw are to fine for this ripping work. The two photos above show a type of back saw that is outside of my experience. I am fairly sure that they are of European origin. The simple riveted on back and the offset handle features that are new to me but I guess that they work well as they do seem to be fairly common. Note the holes in the saws. This is done with many saws to allow them to be hung from a nail on a wall to keep them out of the way when not in use. The two saws above are what I class as Dovetail Saws. What defines it for me is the type of handle and the size of course. They fit nicely between the tenon saw and the gents saw. It was fairly common to see both type of handle being used for dovetail joints.